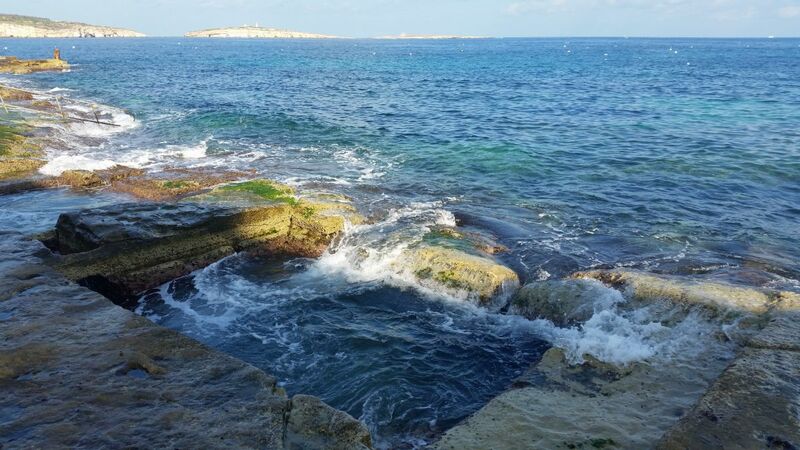 Malta a tiny rocky island in the heart of the Mediterranean Sea. 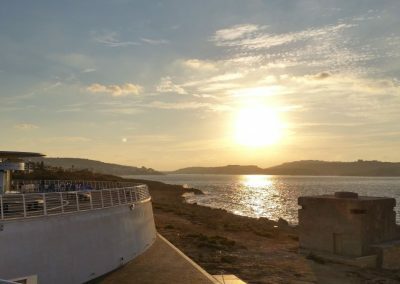 An island where hospitality and unique heritage are offered together. 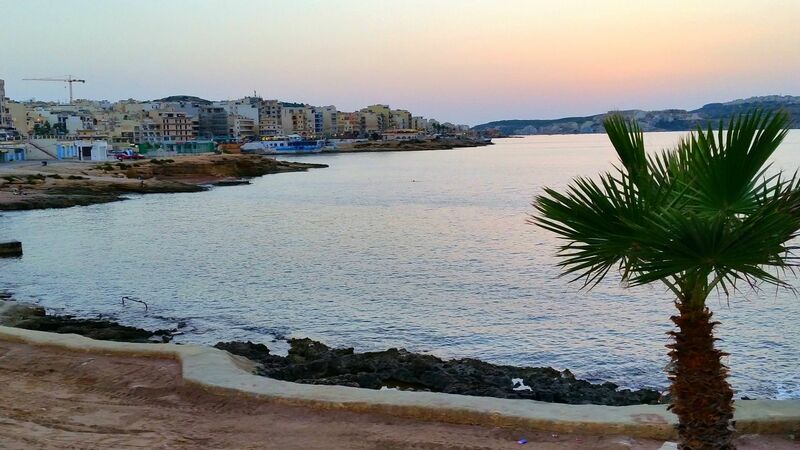 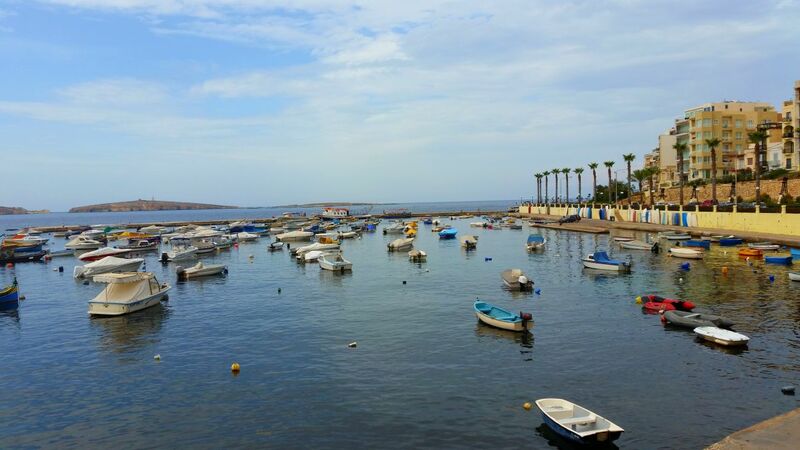 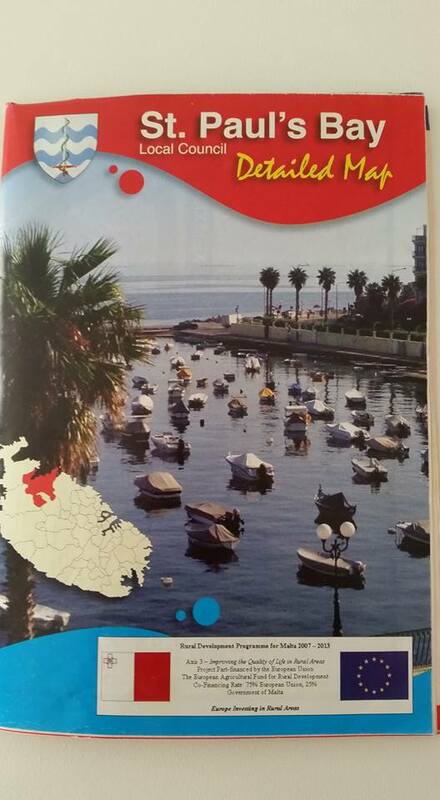 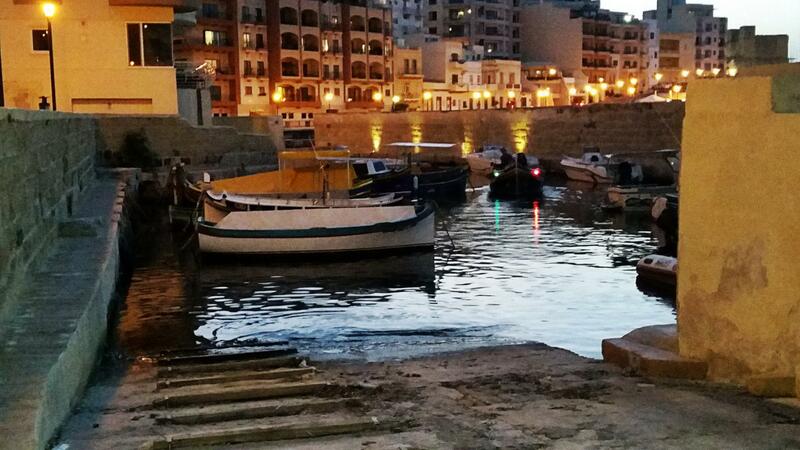 How about St. Paul’s Bay, one of the most populare town in the North East of Malta? 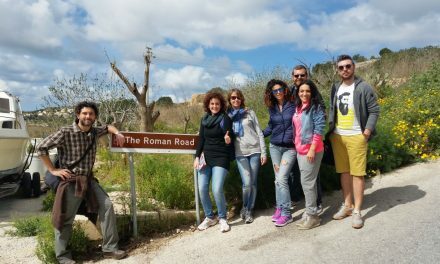 Today my dear explorers we are going to walk along the history! 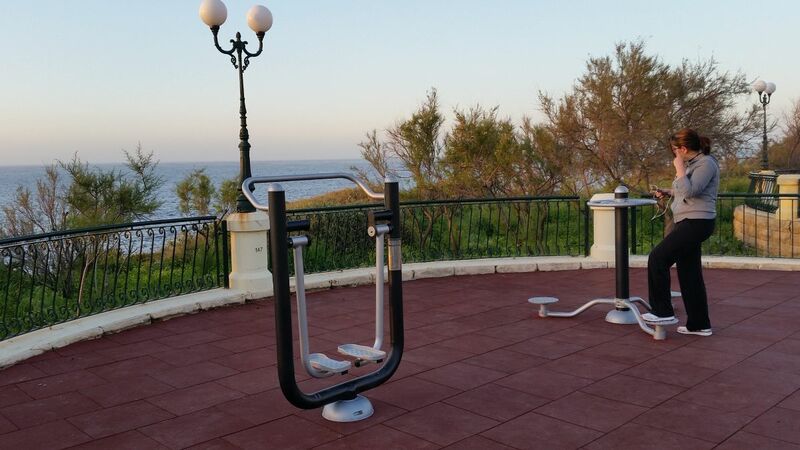 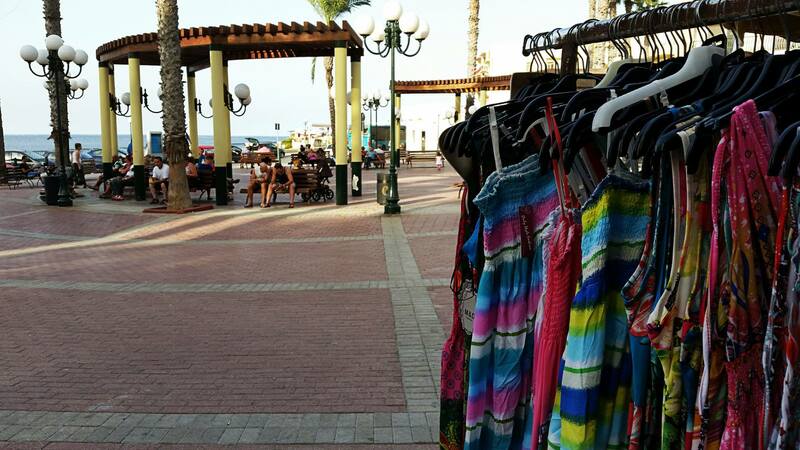 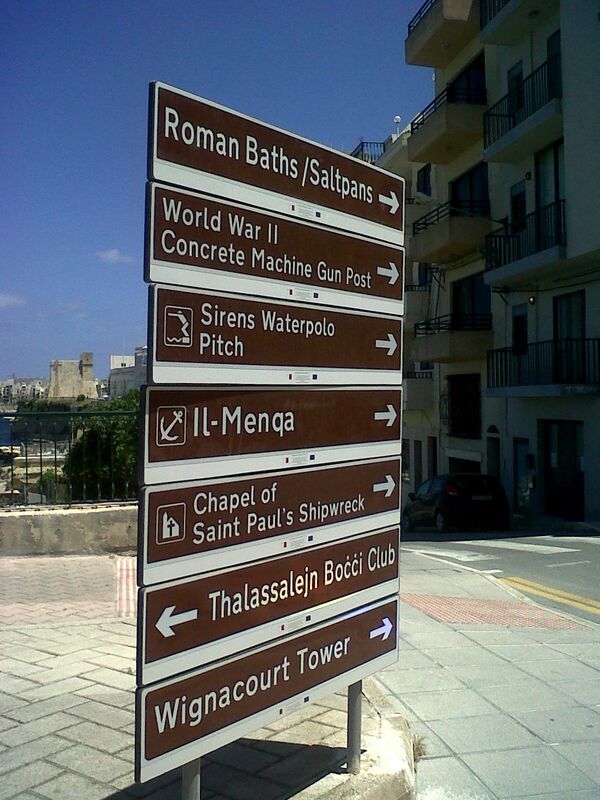 Yes, just along the St Paul’s Bay Promenade. 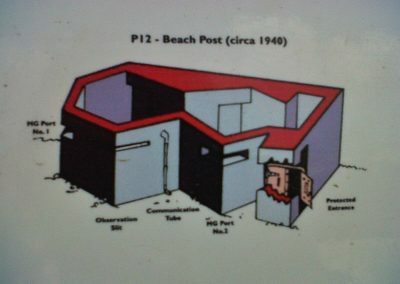 Before starting walking, here the map, click on the red pin for more info. 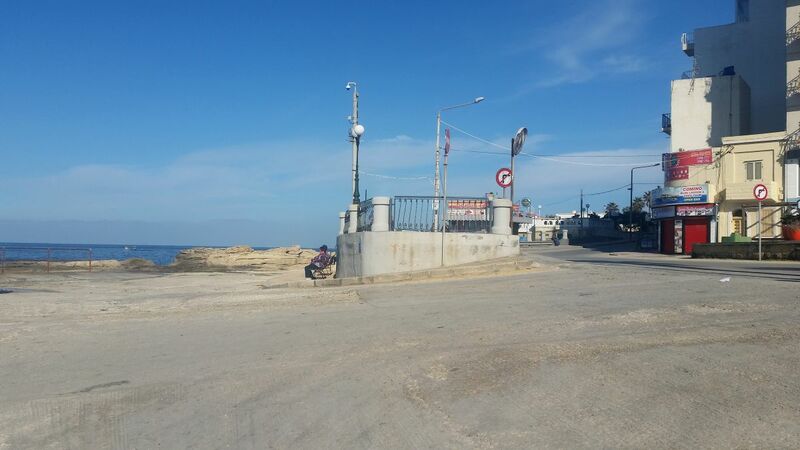 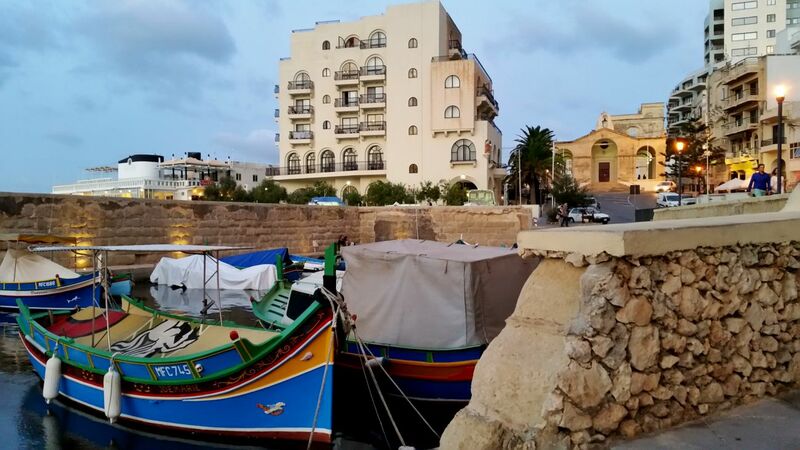 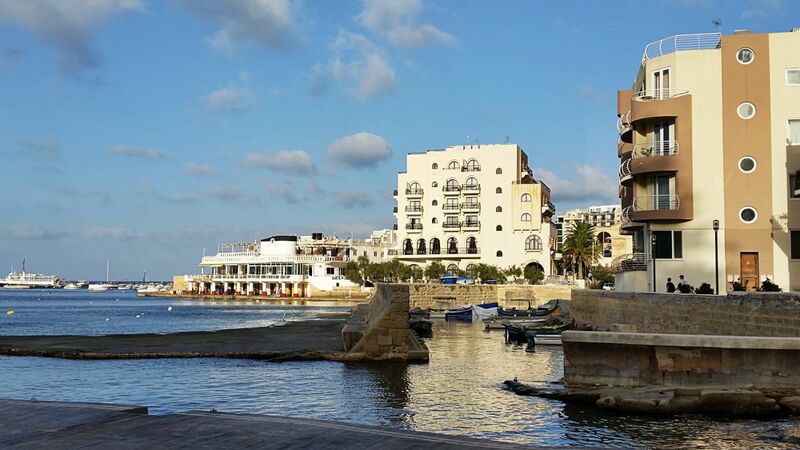 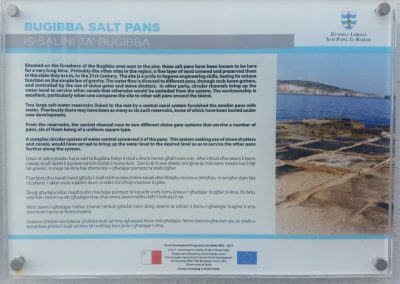 Bugibba is the central area of St Paul’s Bay, where is the main square with the clock. 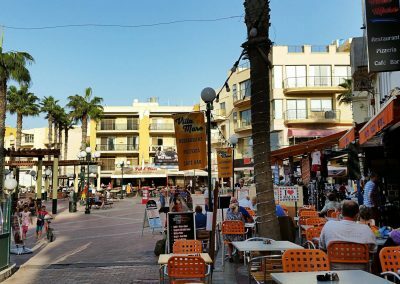 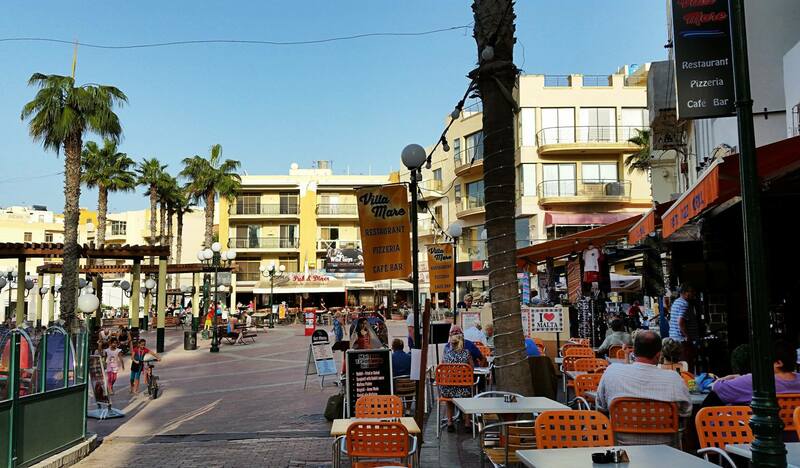 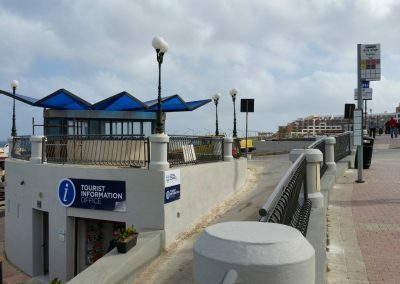 This is the lively hub of St Paul’s Bay. 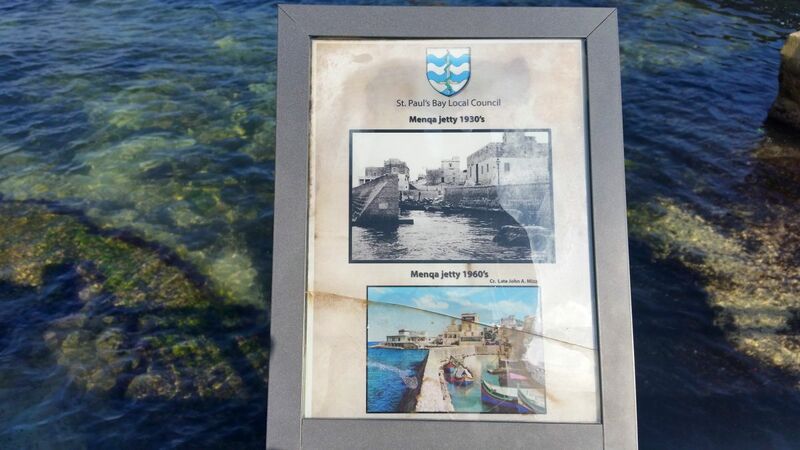 The oldest inhabitants told me that prior to the 1950s St. Paul’s bay and its neighbouring settlements such as Bugibba and Qawra were small fishing and farming based communities. 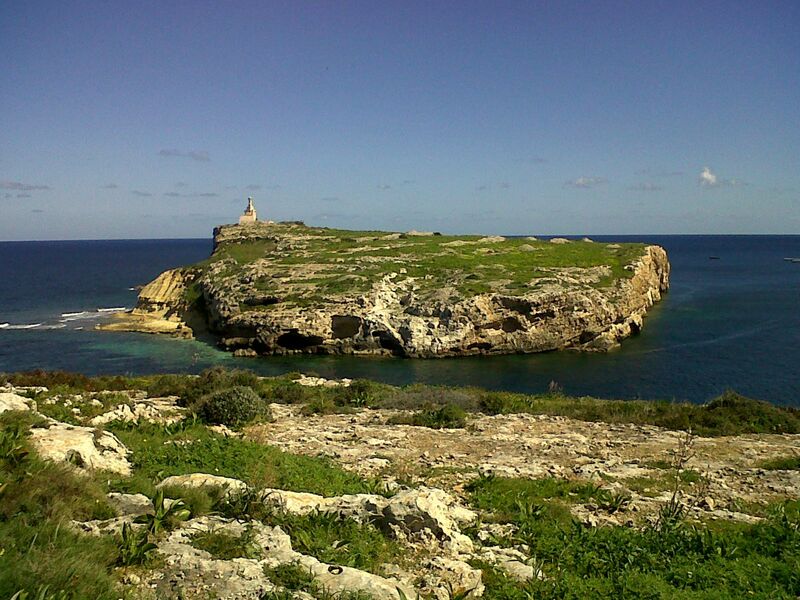 Nowadays all the area of St Paul’s Bay includes the villages of Xemxija, Burmarrad and Wardija. 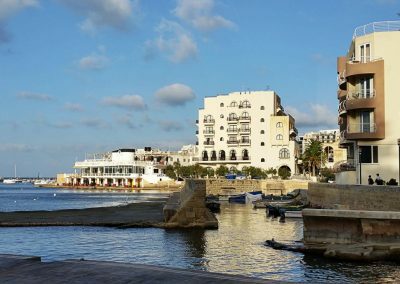 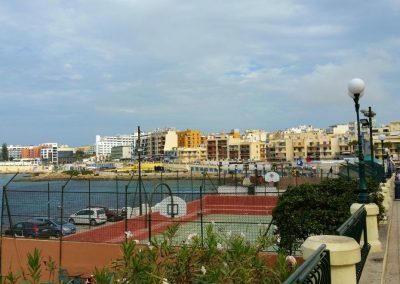 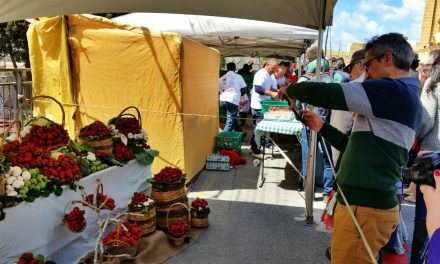 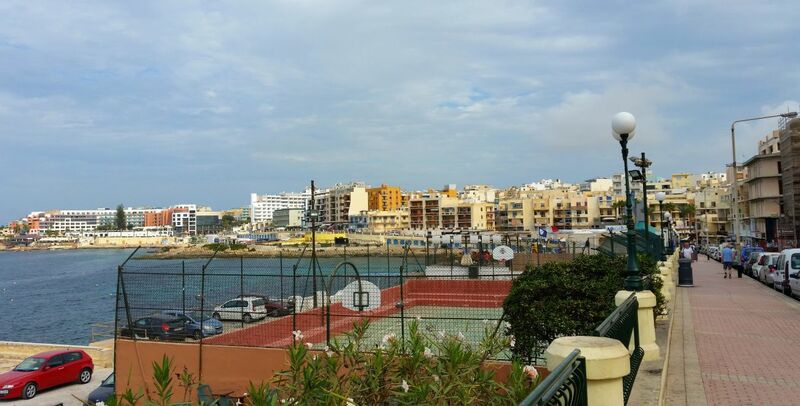 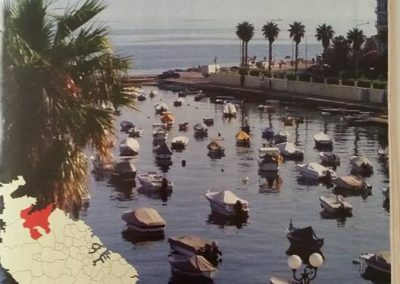 You will probably have noticed the huge development of flats and accomodations, this is the result of the ‘70s strong economic growth, when St. Paul’s dreamed to be one of Malta’s leading international destinations. 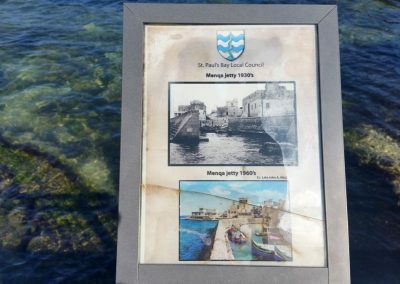 Behind the messy image that St Paul’s Bay can give architecturally speaking, what fascinates me is that along its promenade there are traces of many generations who landed here for different reasons. 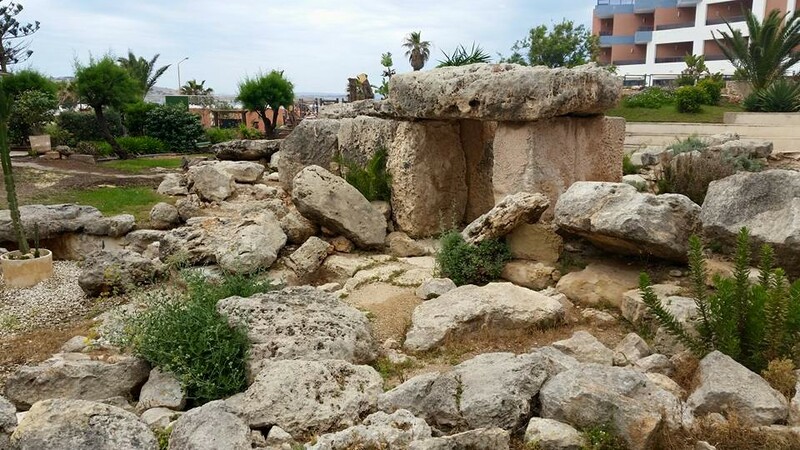 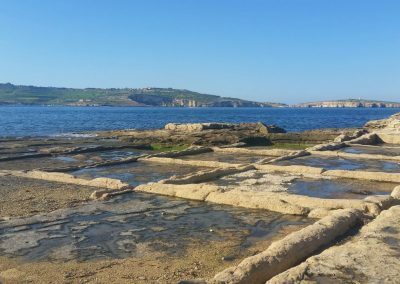 Once upon a time, between the 5,200 to 4,200 B.C., after the end of the last Ice Age, a bravery group of farmers of the Neolithic Era arrived on Malta’s shores probably from the nearby Sicily and after a risky journey across the sea on primitive boats. 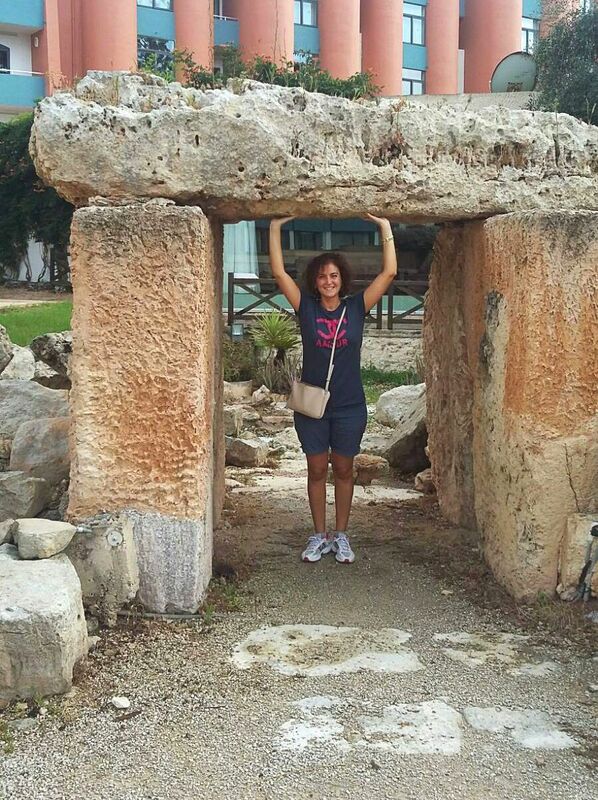 At some point, this population have built the oldest freestanding stone structures in the world! 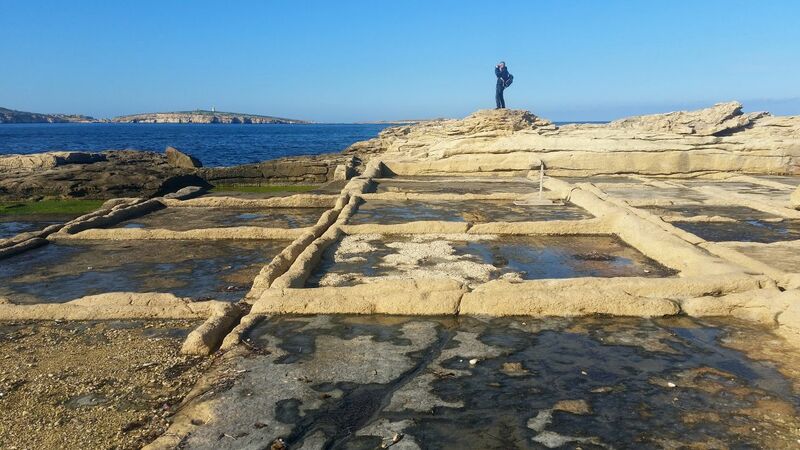 They built around Malta and Gozo over 30 temples complexes during their 1100 years history. 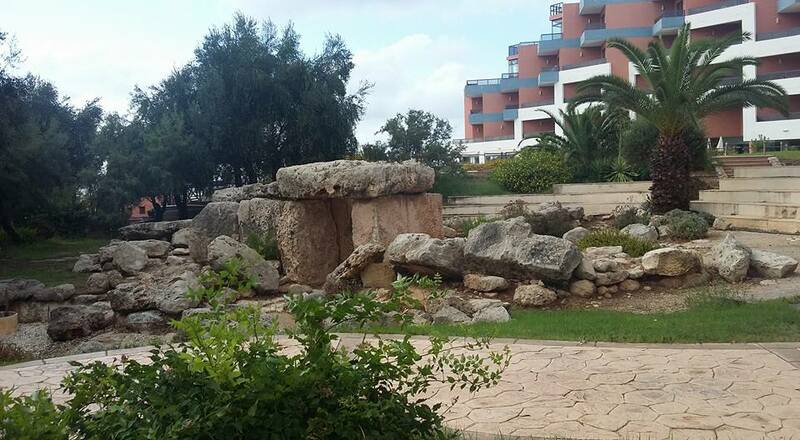 The other is inside the garden of the Dolmen Hotel. 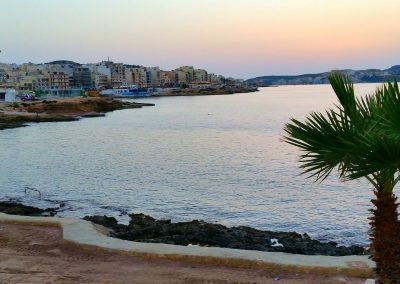 We also know that Malta historically was the crossroad of many Mediterranean Civilizations, like the Phoenicians, Punic and the Romans. 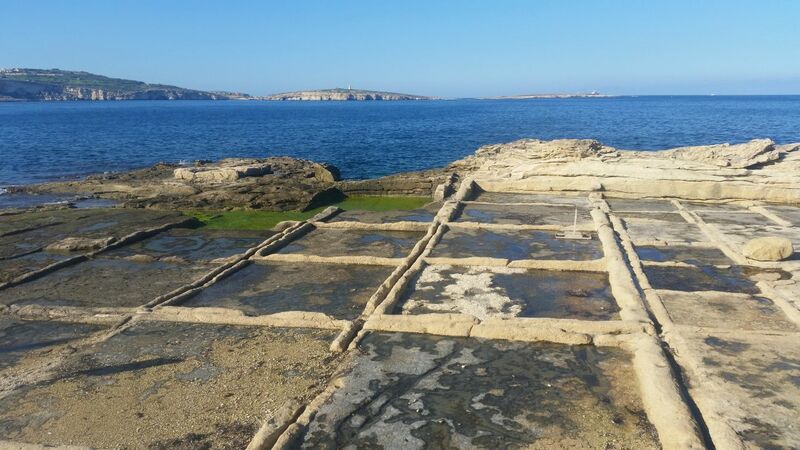 The latter lefted many traces and memories of their society and culture. 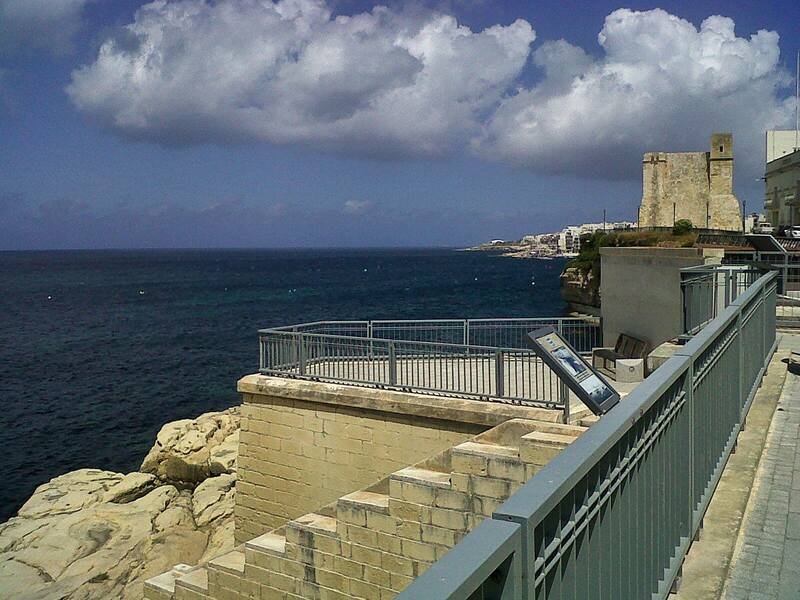 In fact, along the St Paul’s Bay promenade you will find some Romans spots. 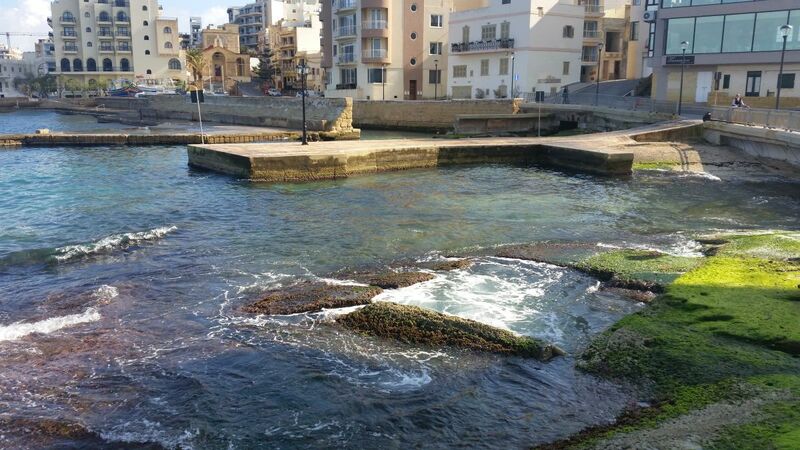 I am reffering to the Roman Salt Pans on the foreshore of the St Paul’s Bay Pier. 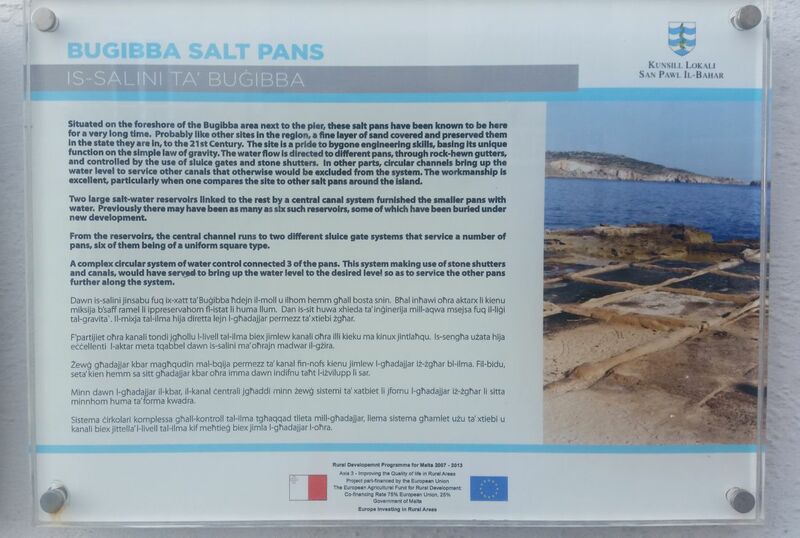 The “Salini” are the result of the ingenuity of the Romans and their engineering skills that could be able to use the gravity force to convey the sea water into the pans and let then the sun dry out it to finally collect the salt. 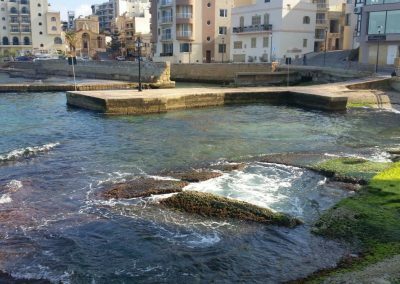 The other Roman Spot is the area next to the old little pier il-Menqa, close to the Chapel of St Paul’s Shipwrecked, just few meters far from the other one. 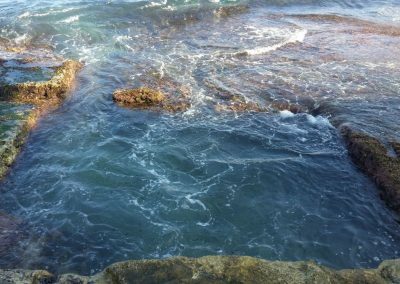 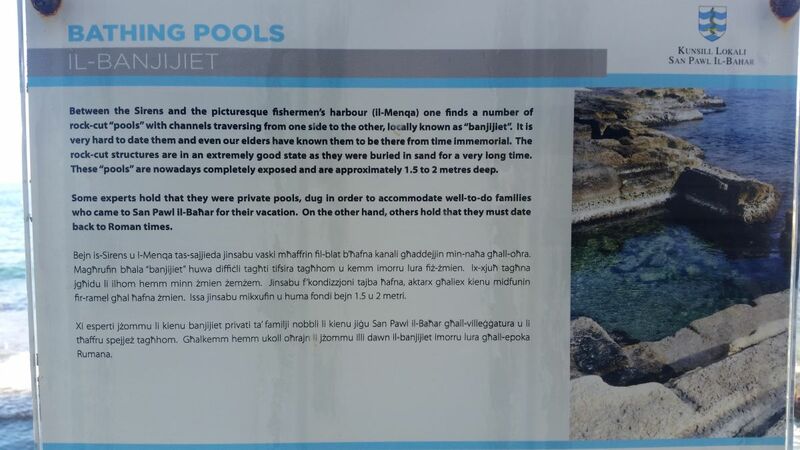 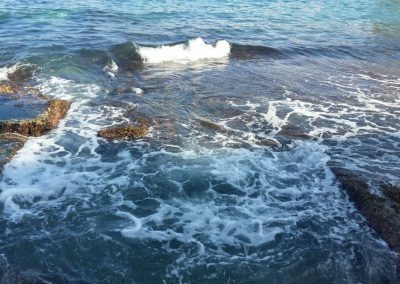 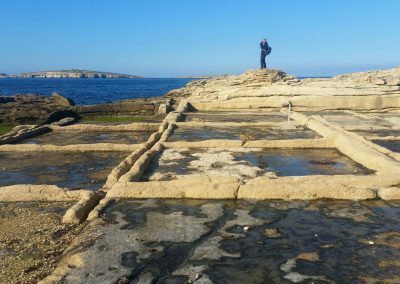 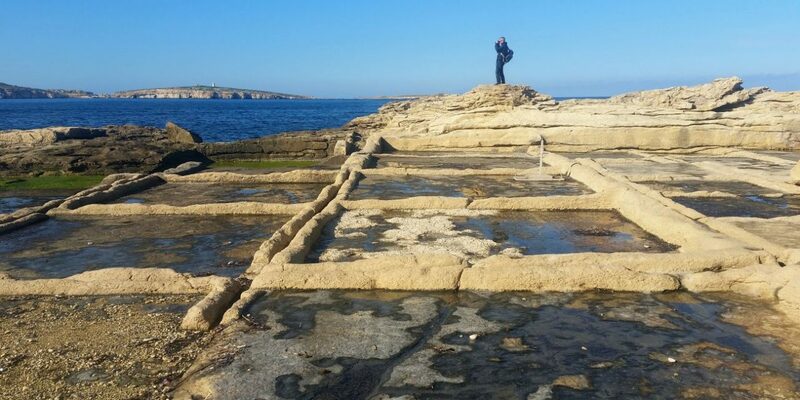 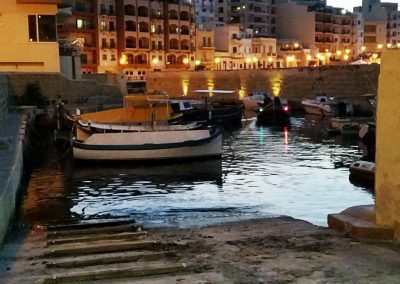 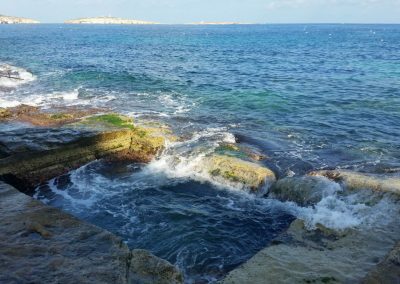 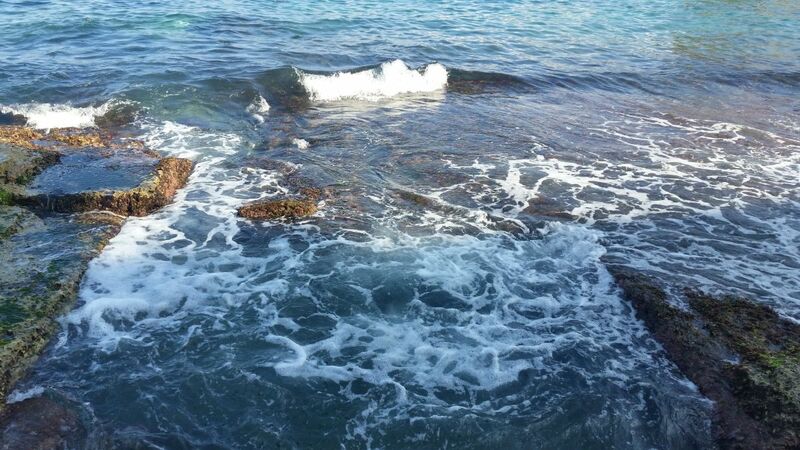 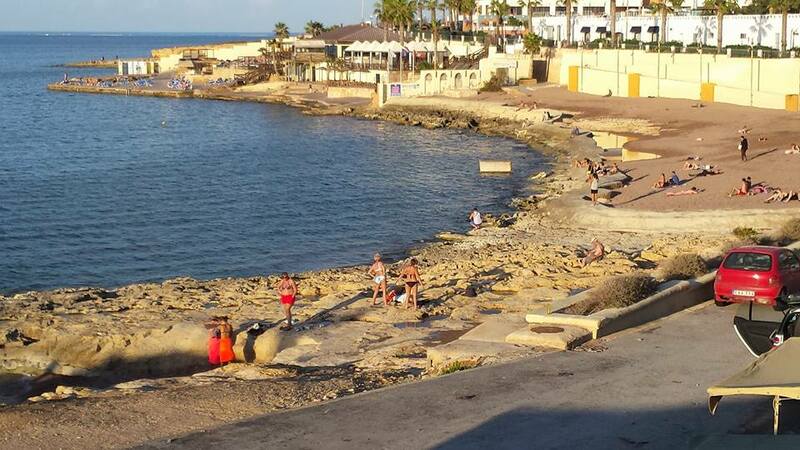 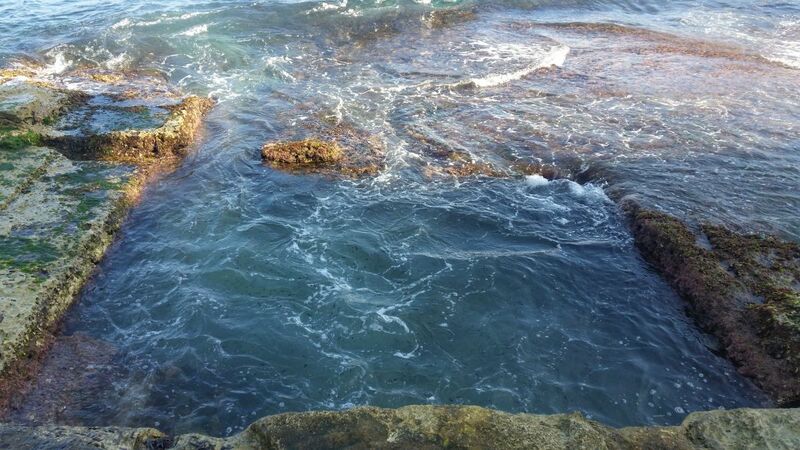 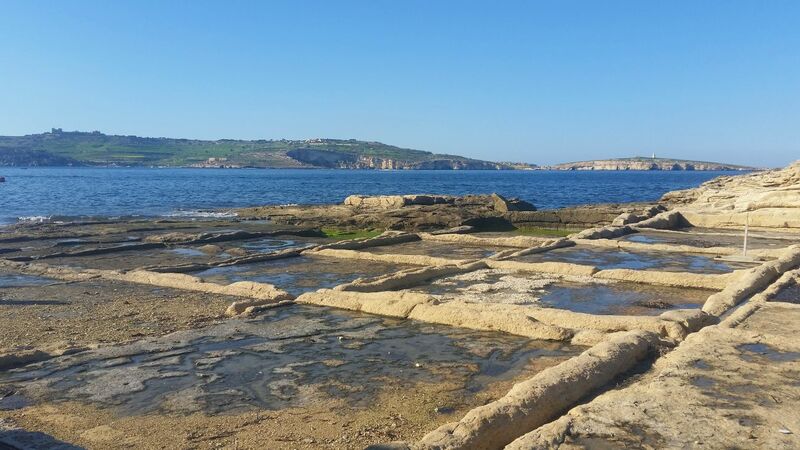 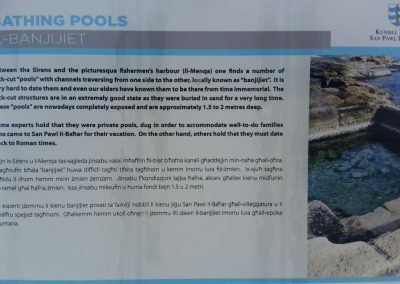 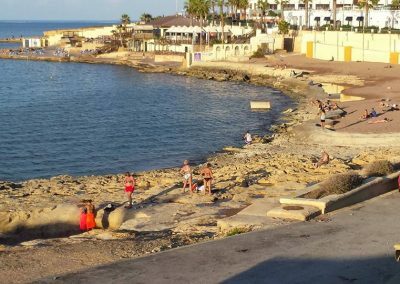 You will see along the rocky promenade (in Sliema too) some rock cut pools… Now someone said that they are old Romans baths, others said that they were built by the wealthy English as reserved pools for their women who could swim with a certain privacy covered by the deep walls. 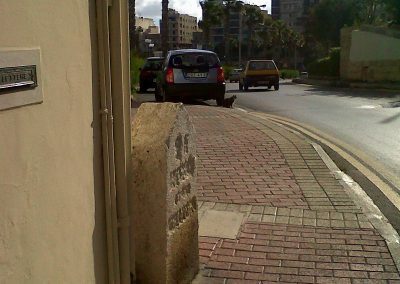 Another symbol of the presence of the Romans in our modern culture is the milestone, a large cylindrical stone that the Romans used to position along the roads for communication purposes. 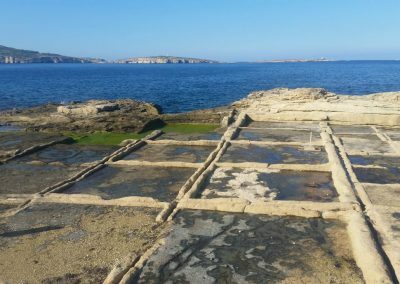 Basically the milestones were markers fixed at one thousand double-step intervals to facilitate the movement of soldiers and goods when moving along the empire. 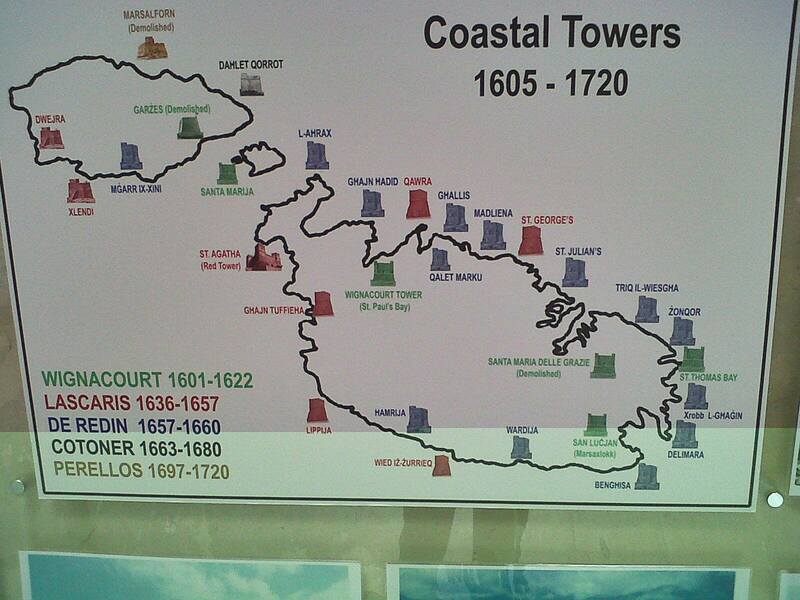 Is like our GPS that tells you where you are and how much kilometres are left to where you want to go. 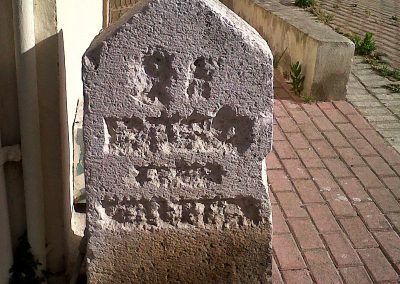 Actually the Latin term for thousand, ‘mille’, is the origin of the word ‘mile’ and therefore the term milestone to denote the distance markers along the roads. 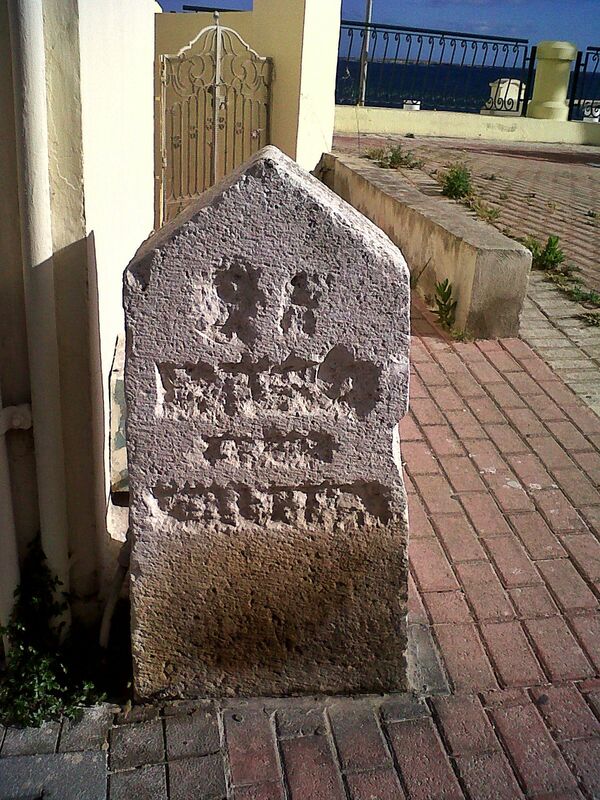 There was another useful purpose for the milestone, in fact not only they informed travellers of the direction and distances, but also they served to regulate the fees charged by horse-drawn coaches and other means of transport. 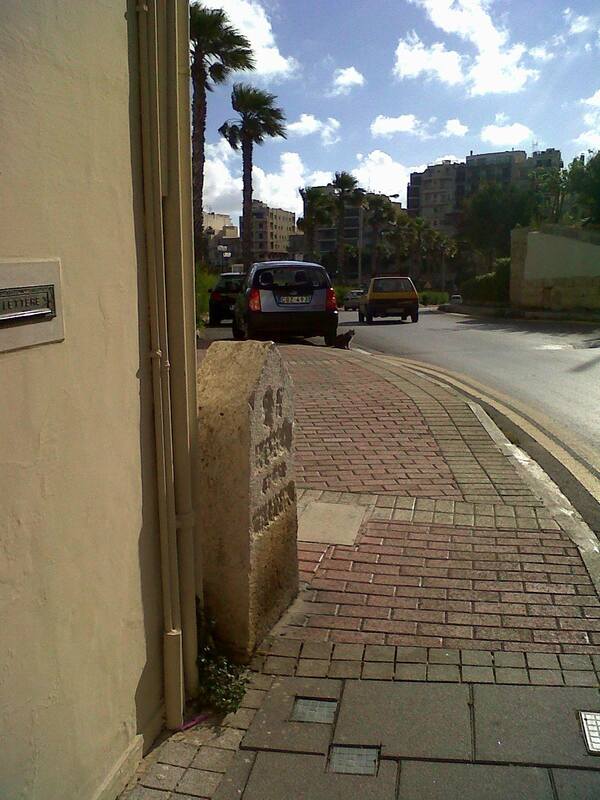 Now the one you see on the picture is the modern development of the milestone used by the British who developed the system of milestones in Malta. 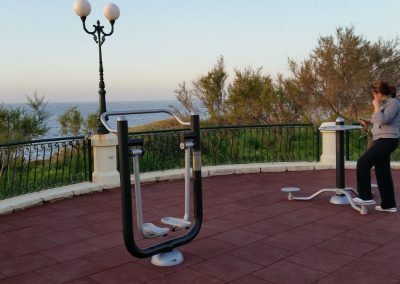 These normally consisted of large dressed slabs of local hard rock. 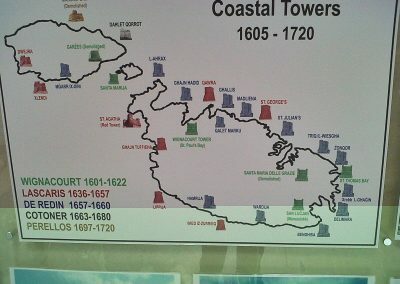 They would have engraved the distance from and to a given location. 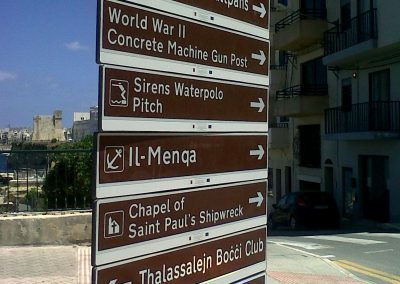 Many of these milestones were removed during the Second World War but three of them are just in St Paul’s Bay. 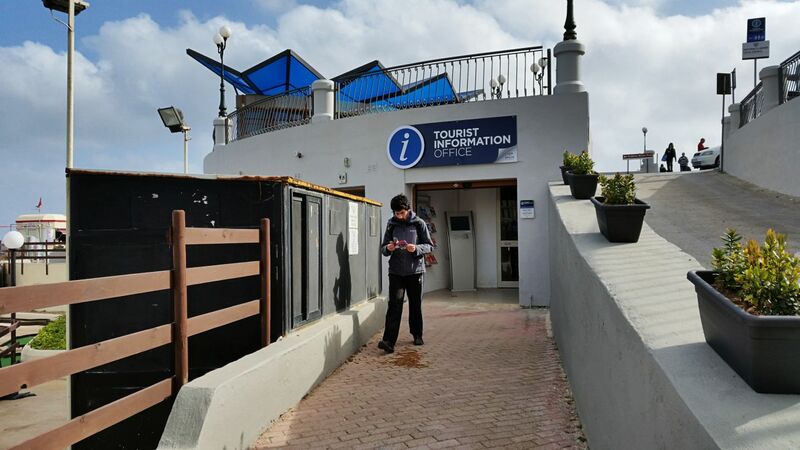 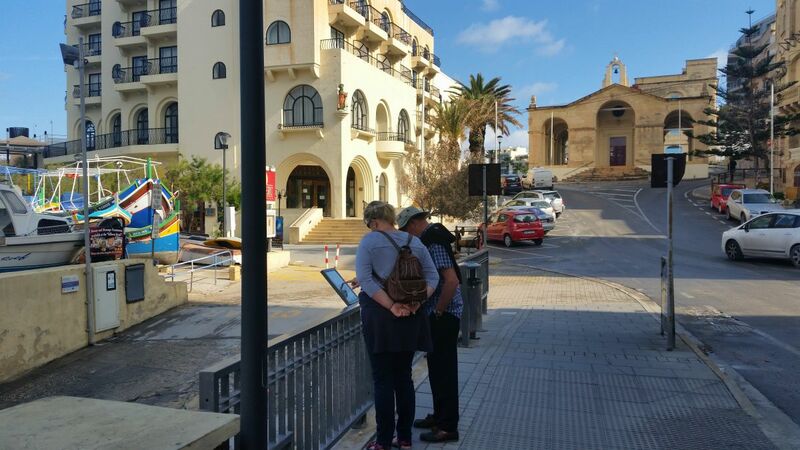 The one you see in the picture is near St Paul’s Shipwreck chapel, another is near the chapel of Our Lady of Mount Carmel in St Paul’s Street and the last one is along the road the goes to Mellieha. 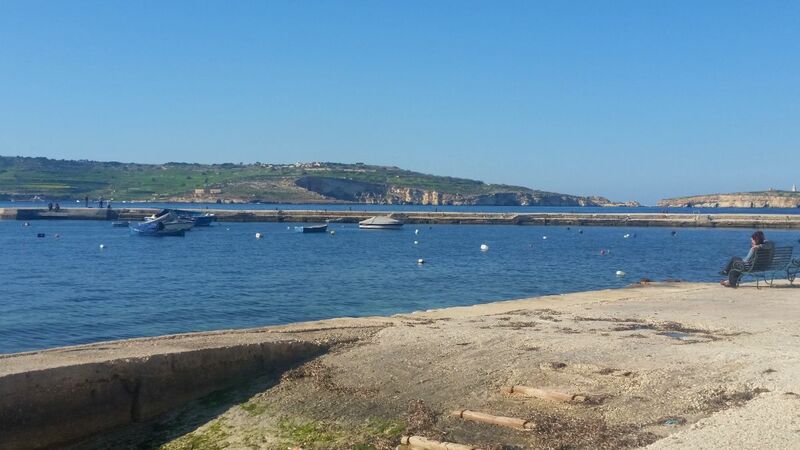 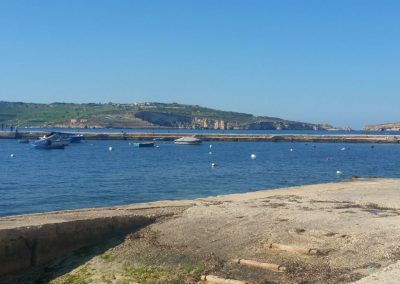 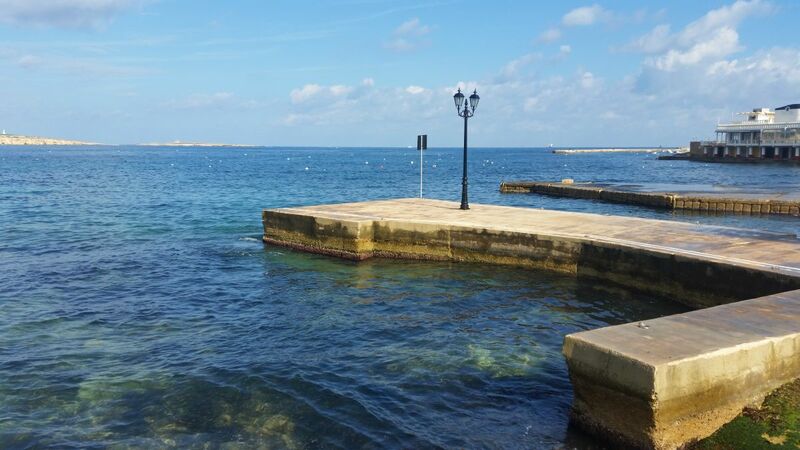 Additionally, St. Paul’s bay shores are linked to the most important historical event that had touched the North and all Malta: The Shipwreck of St Paul. 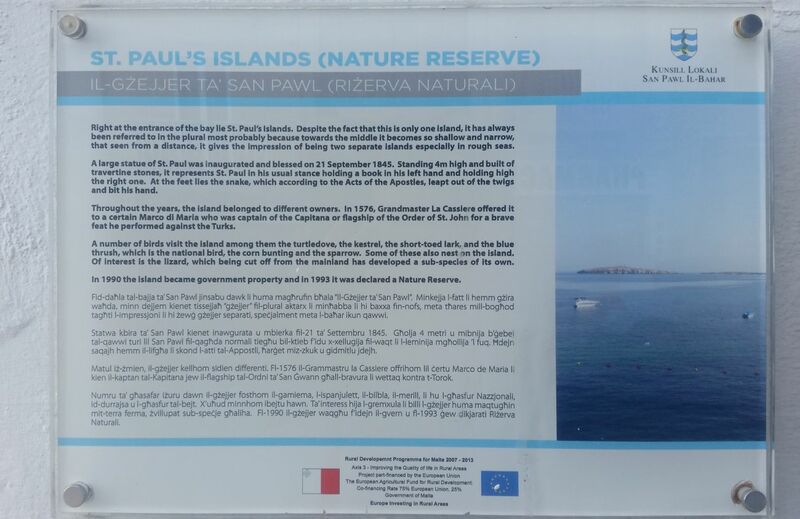 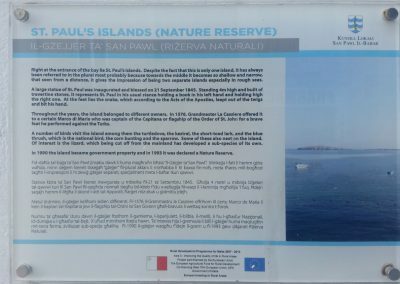 The name of the village as well as the little island in front of the pier is dedicated to St Paul to commemorate this event. 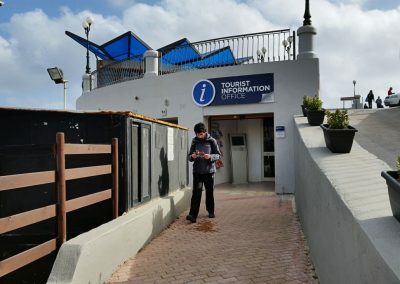 Why is considered so important his arrival? 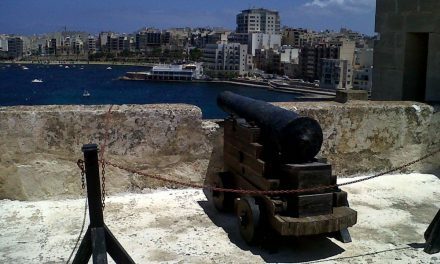 Because in Roman Malta Christianity is thought to have started with St Paul, at that time the Apostle Paul. 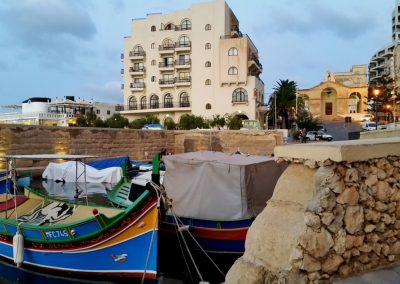 Click here to watch the video of the St Paul’s Shipwreck Feast in Valletta. In order to increase the coastal defences of the Maltese Islands, Grand Master Wignacourt, offered to build more towers at his own expense. 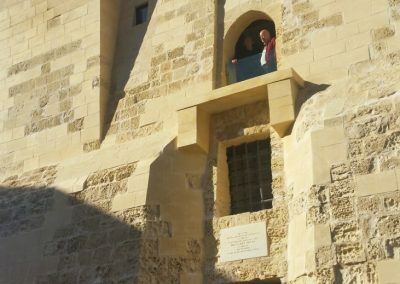 The first tower was constructed in St Paul’s Bay and the Grand Master personally attended for the blessing of the foundation stone on 10 February 1610. 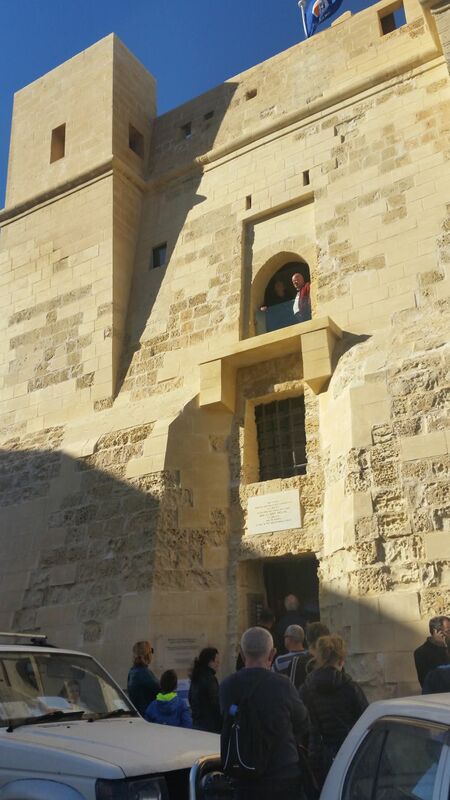 The Wignacourt Tower is the oldest surviving one in Malta. For me it was interesting to visit it and discover more about the soldiers’ life, clik here. 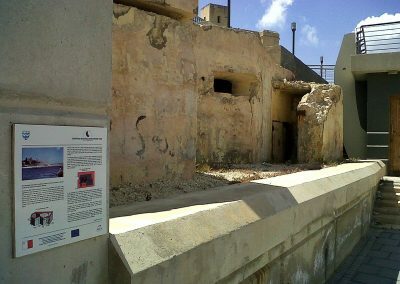 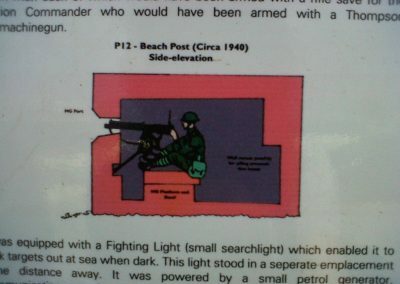 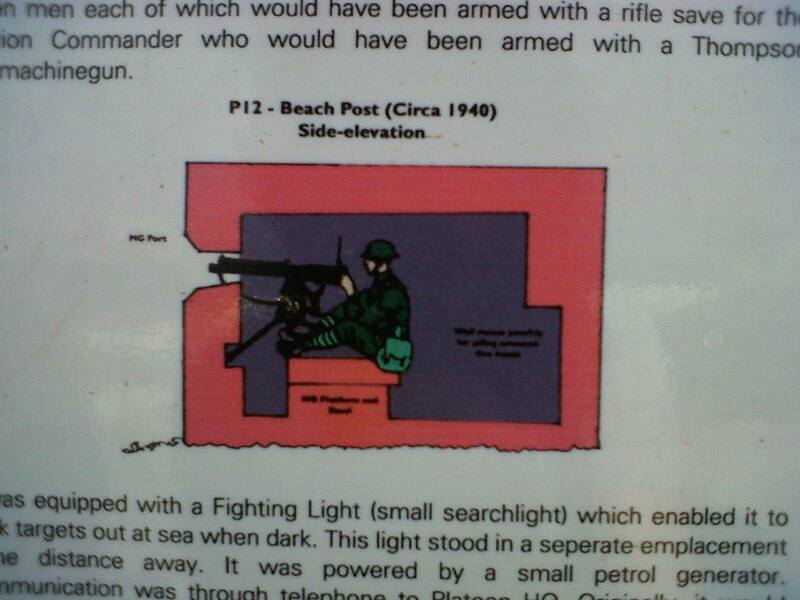 About the soldiers, along the coast you can see some concrete pillbox or beach post (one in the area of the old St Paul’s Bay pier il-menqa and the other one near to the Aquarium) the last type of fortification built by the British military prior the II world war. 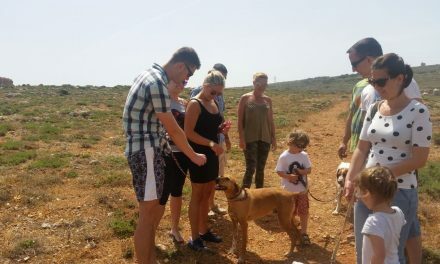 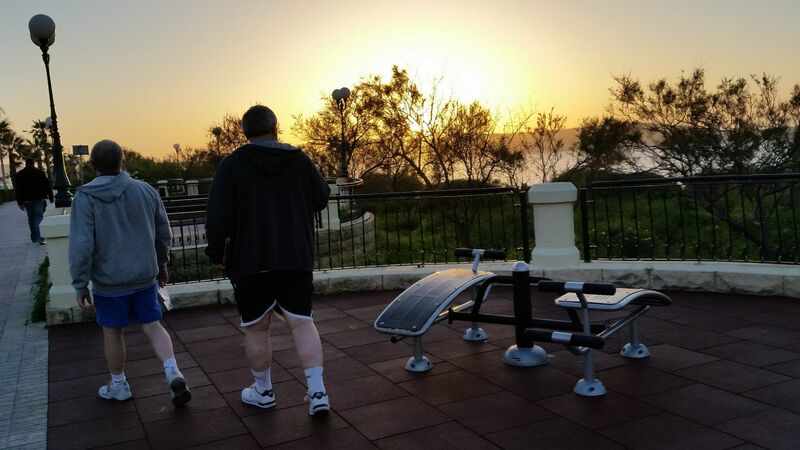 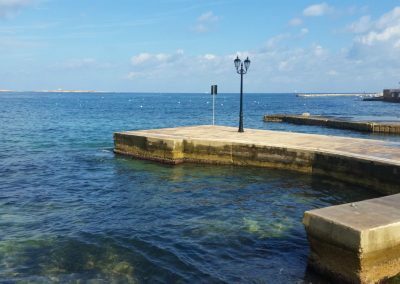 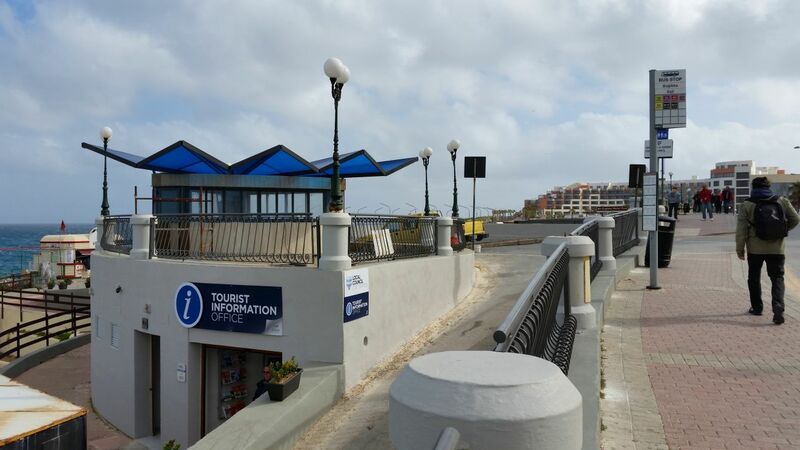 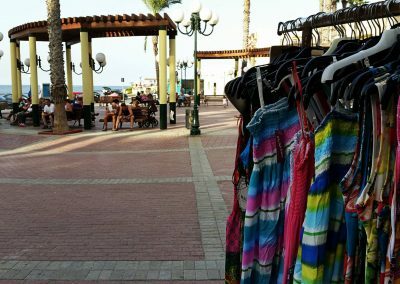 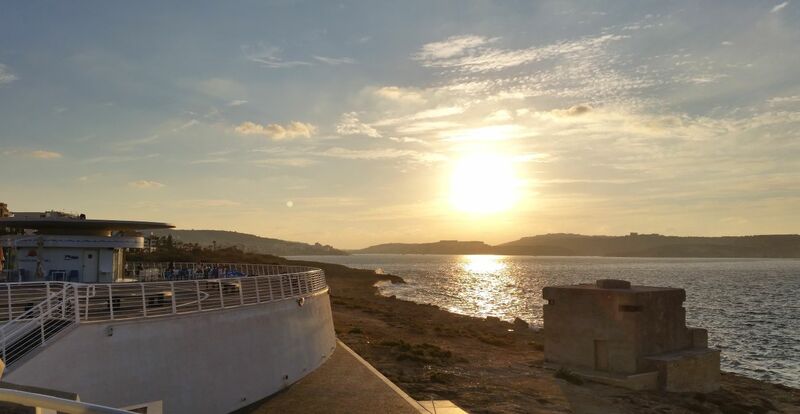 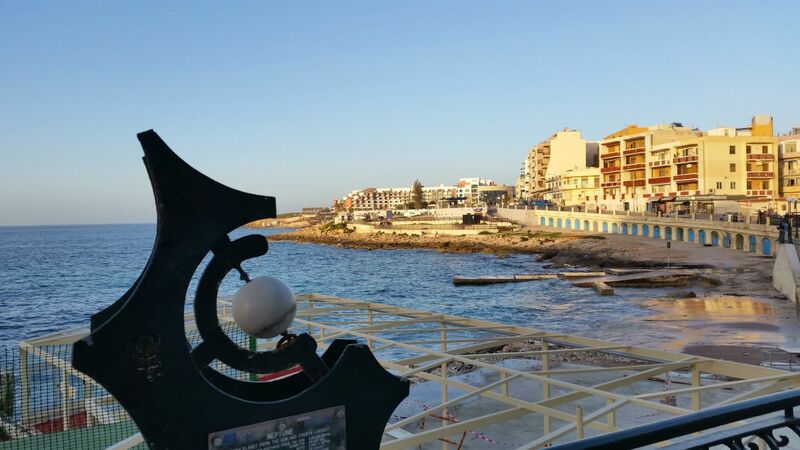 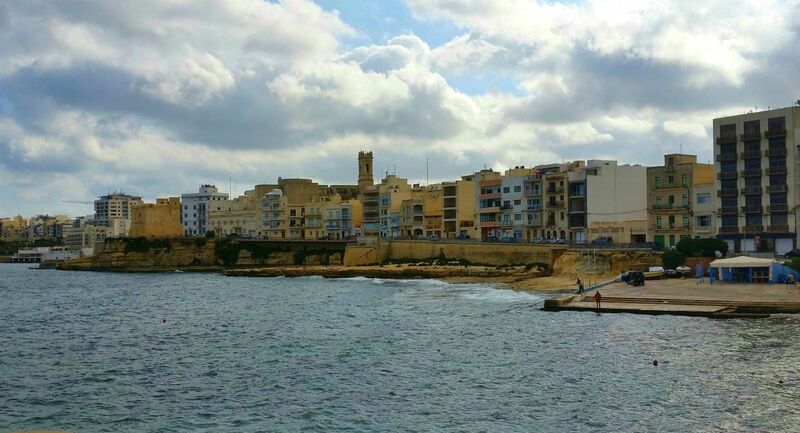 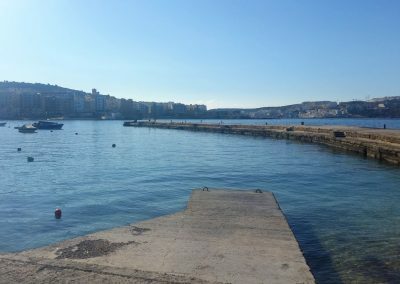 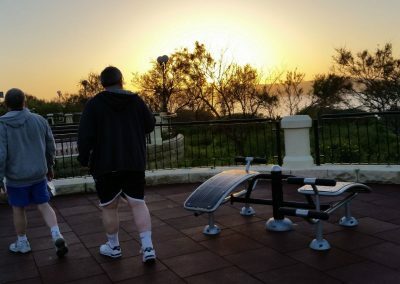 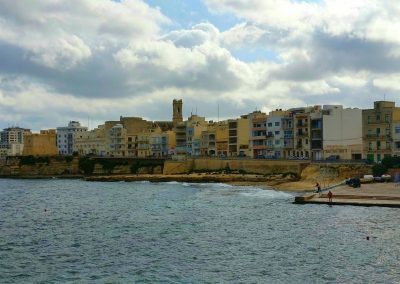 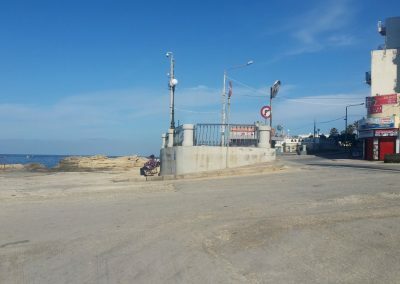 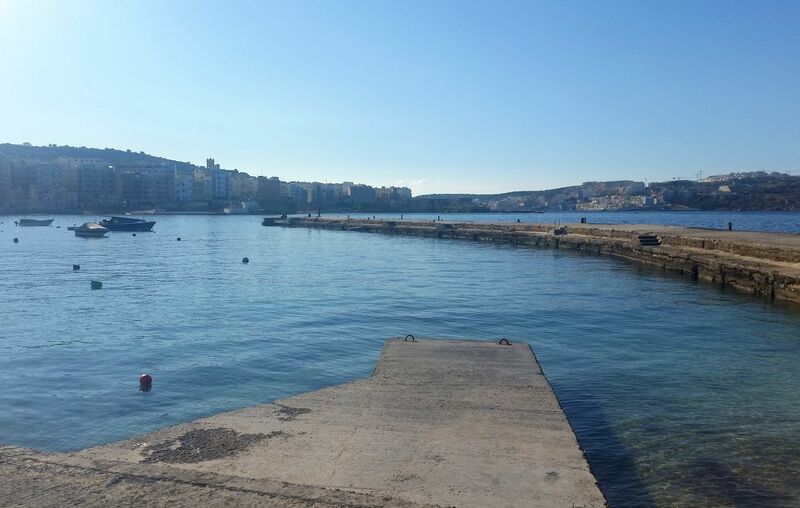 If in the past, the promenade of St. Paul’s Bay was a stage for special arrivals and battles nowadays is a lovely and scenic walk along the history. 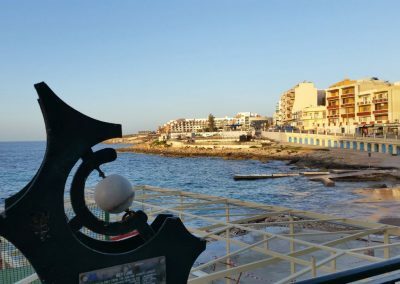 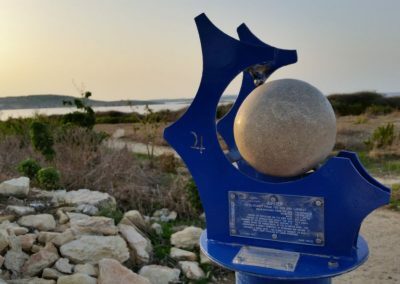 The Malta Astronomical Society has developed a ‘planet walk’ with scale models of our solar system. 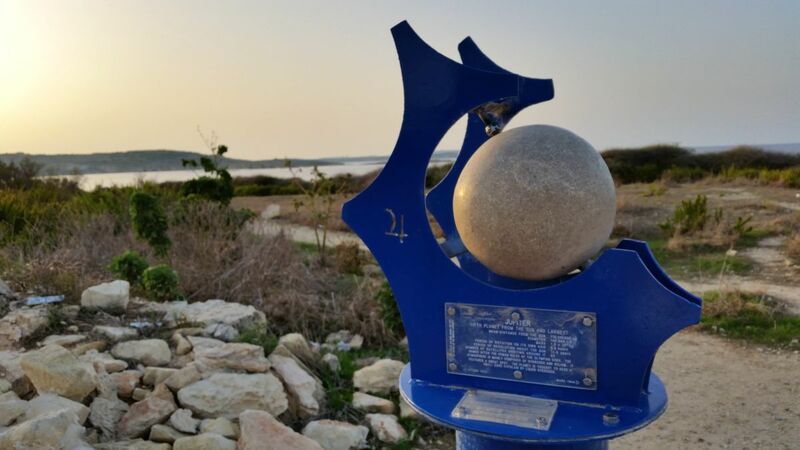 Kids love rotating the planets and reading the info on them, and racing to find the next one! 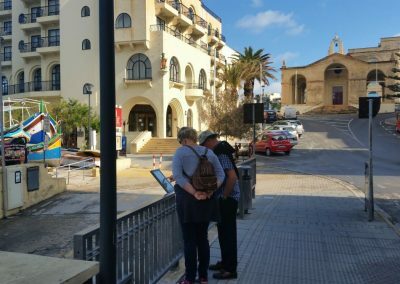 For more info about St Paul’s Bay attraction see the map below that you can get at the Tourist Info Point close to Bugibba Square.